My name is Varrgas, i am a (little, very tiny) french streamer on Twitch from 2 years now, and i have a big problem but before that, i want to say Thanks you to all the OBS scene because i will never be able to do what am i doing with all the people behind this project. I am often silent but i came there sometime with issue and was always able to fix them alone, just by reading. But today it seems that is too big for me, so i need your Help and if you have some time left. Well, i have a problem with OBS, or maybe just my connection, since some Days now, i wasn't having such an issue, this is the first time for me. I have switched to Win 10 some days ago so maybe that why ?... I don't know. There is a log File included of course but i will explain it with my words just in case. I know the log file have some mess because i am still moving things and stuff since i have installed Win10 some days ago, sorry for this. Well, i start as always, open OBS, prepare things, push Start, and i am on line on twitch, the stream start. Sometime, because my internet isn't perfect, i loos some bandwidth but i think this is just random and normal. But, since some days, OBS loosing connection with Twitch, OBS is disconnected "but" i still have internet... i can still read the chat in the OBS module, and write message, and my viewers can still read them (i did test, my message aren't poping with delay). Sometime, my Bitrate going to 0/kbits and then coming back in green. My internet is fine, it seems it is. I have checked if there is malware, nothing, but is is a fresh install so i don't see why there would be some. I know that i have some frame drop due to render lag or encoding sometime, i must maybe lower my Bitrate or my stream resolution or FPS but when i see the very low % drop i think that this isn't so important and keep as is give a better quality close to all the time but if this is part of the issue, tell me please ! To me it looks like you lose a lot of frames due to insufficient bandwidth / connection. 3,7% looks like you have problems with upload. But i am not a professional - i can be wrong about the connection. Maybe it is Twitch by itself. Have you tried to connect to another Twitch server? Because those frame are in reaction of the connection lost (a part of it), the time before the connection go totaly off make OBS impossible to send anything and so this cause the dropped frames. I still have some dropped frame but this was always the case, 3.7% is nothing after 2 hours, in my opinion, and again, i always have around 1 to 4% dropped frame, but i never have those OBS disconnection. I tried all the EU Twitch server, so 15 different server, for around 4 hours each, and all the time the same, totaly random, sometime after an hour, sometime 5 time in a row in a 10min window. I didn't tell it before but i tried with a very low quality stream, with 2000 bitrate, 30fps 480p with just a movie, not even a game, and only 1 scene, the capture of the movie, nothing else, not even the sound. Okay then i am out of ideas. I Remember after the last big update i wasn't able to stream correctly over the streamkey - but i was able to stream over oauth and connect obs directly to twitch - but i guess you already doing this. Also, try to set your audio devices and capture devices sample rate to 44000. Your 4.5Mbps is slow for uploading. There should be at least 20% headroom for fluctuations in upload speed. In other words, if you can only do 4.5Mpbs on good days, your bitrate target should be below that by 20%. At 4.5Mbps, 20% less is 3.5Mbps. You should drop the FPS down to 30 and not use the 60. For the Gaming Bar, i did it after some deeper recherche after posted on this forum. And since then it change nothing except one thing who isn't about connection issue (it was my capture cards who sometime stop capturing and freezing, solve with disabling game bar). You can stream or record something at 60fps 4K with 1000 Bitrate, this is idiot, yes, but you can do it without loosing your connection to the service or breaking your connection. Thanks for trying to help me but... this is obvious that what you talk about as no connection with the issue, if this was just because of those settings, the crash will not happen so randomly and have already happen since a long time ago. It can happen 5 time in an hours to nothing in 6 hours! I know the Twitch Guidlines, if that was that simple i will not be there, no offense, but i am streaming since 2 years, the issue is more complex than just basic requirement. I never had issue with my actual connection to stream at 3.000Bitrate Stream with 720p at 60fps since 2 years, Always with less than 1% dropped frame and less than 0.5% rendering lag and 0% Encoding Lag. But... thank you... i suppose. A technician was come to make "something" but he was so quick and doesn't really care that i didn't understand, the only thing i understand was about frequency. But after he leaved i did an other Test, and the issue was still there. So i called the provider again, and they tell me to change my rooting device, i did it, and it seems that it work again, great, but i am not 100% sure yet. Just in case i will come later send logs etc just in case this can help someone in the future. Edit: I was happy too quickly, the connection still droping to 0 randomly, i don't know what to do and they tell that an other provider will change nothing. yes i have, what i see is that everything is fine but randomly, i have a tiny section in red, tag as "unstable event" and when this happen on OBS i see my bitrate dropping to 0. Sometime it is quick enough to go back to normal, and sometime not, and OBS loosing the connection with Twitch and the Stream crashing, then it take some time to reconnect to Twitch. 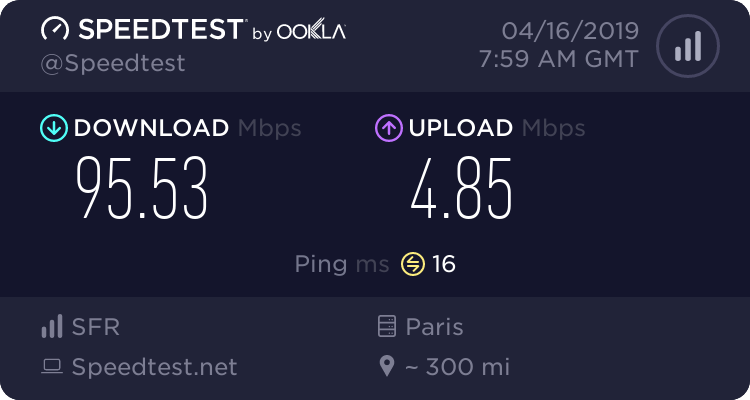 I join an image of a 1h hours Test on Twitch to show you, i know that there isn't perfect connection but those issue didn't happen 2 weeks ago. And i have the same thing with the older modem or the newer. Both with a 3000 Bitrate stream at 720p 30fps (and 60fps) or at 1000 bitrate 480p 30fps. 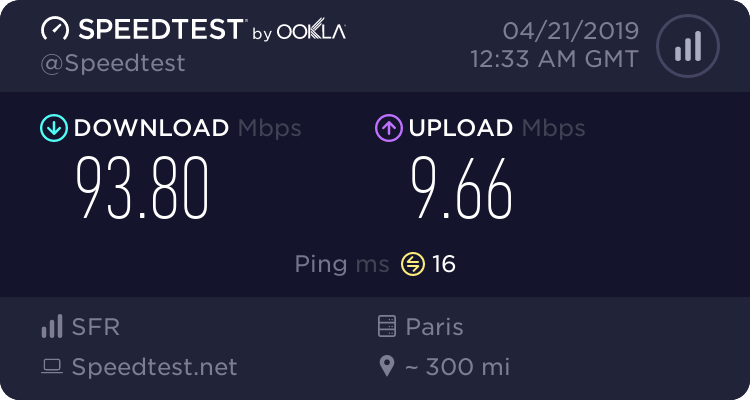 Edit: Ho, interesting, i just did a new speed Test before posting this, and yesterday, i was having the same upload, but my download reaching 191.57... Same server, same provider, same stuff, like if they nerfed my connection ??? I have same problem whis youtube, you find fix this problem?